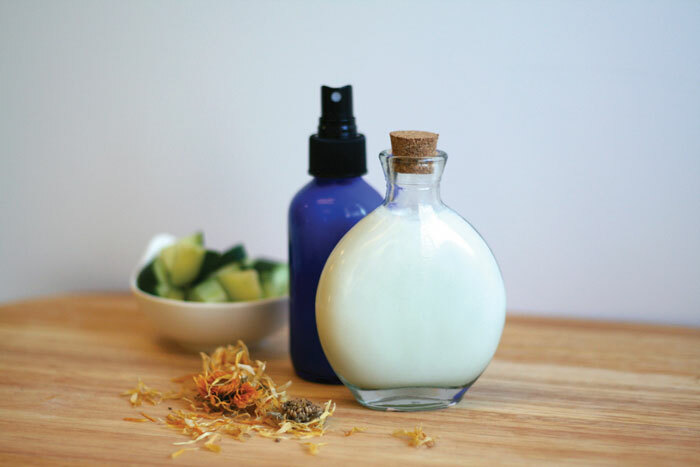 Probably one of the more fragrant and luxurious beauty DIYs I’ve come across, this Cucumber Rose Sunburn Relief recipe has me feeling all Cleopatra with coconut milk and roses. Can we get much more luxe than that? The third and final beauty DIY I’m excerpting from 100 Organic Skincare Recipes is one I’d use regardless of whether or not I had a sunburn. The skin-softening and soothing ingredients in the recipe could easily be incorporated into a weekly milk bath for your spa nights at home. Enjoy this final excerpt, and let me know if you’d like to see more excerpts in the future from some of my favorite beauty books! Note: This is a not a series of sponsored posts. I really love this book and found the recipes approachable, interesting and beautiful. I reached out to the publicist to get permission to share these recipes with you because I thought you’d enjoy them as much as I do! You will want to have this cooling, fragrant, milky lotion on hand after a long day in the sun. Store this concoction in the fridge and mist this soothing, moisturizing blend on a sunburn for instant relief. The aloe vera and cucumber provide instant anti-inflammatory relief, while the rose and coconut milk offer skin-saving healing moisture to overexposed skin. Put the chopped cucumber inside a strainer or piece of cheesecloth and squeeze out juice. Pour the cucumber juice into a jar. Add coconut milk, rosewater, and aloe vera. Close the lid tightly and shake well to blend. Pour some of the mixture into a spray bottle. Reserve the remainder in the jar. Store in the refrigerator for up to 1 week. Shake well before use. Spray affected areas as desired. Soak a soft cloth and apply as a compress for 10–15 minutes to affected areas.